The term beat is also sometimes used when marking such changes on a bigger scale, across an entire narrative. Some screenwriters work with so-called beat sheets; in the Beemgee outlining tool, the plot event cards are perfect for creating beat sheets, since each card is designed to stand for one plot event. In a beat sheet, a beat is one unit of plot. If you think of narrative as a chain of events, then each beat is a single link. In one school of thought, a Hollywood movie is ideally constructed of exactly 40 such beats. One need not be quite so prescriptive. A beat is an occurrence in a story that changes something. It is an event that has an effect on something which happens later in the narrative – or at least audiences are trained to expect this. Cause and effect is a prevalent force in any story. We mentioned above that plays, such as the ones by Shakespeare, are divided into acts. But not only when an author expressly writes in acts is a story divisible into them. 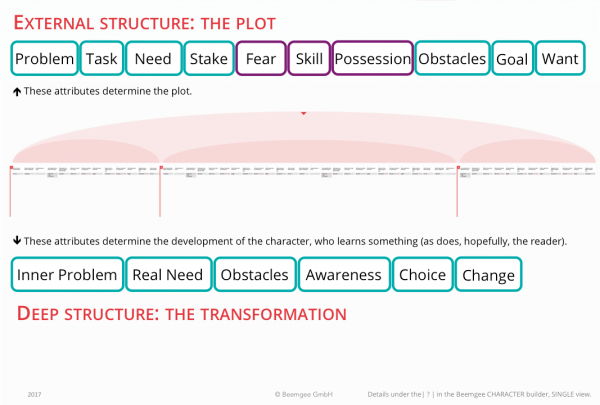 If you analyse pretty much any story in terms of its structure, you’ll probably be able to break it down into sections. Quite possibly you’ll identify, well, the beginning, the middle bit, and the end. That may sound a little trite, but actually we’re getting at fundamental principles that are ancient and powerful. Aristotle describes the idea of thesis, antithesis and synthesis. The Hero’s Journey may be divided into the sections Departure, Initiation and Return. Basically, any story has a phase in which the audience is introduced to the setting and world of the story, the main characters, and the problems they must deal with. This is act 1. In the second and longest act, the audience accompanies the characters as they deal with the problems, face obstacles, and move towards a goal. The last and often briefest act describes the outcome, the (re)solution of the problems set up in act 1. The audience may not always be aware of structure. Indeed, sometimes even the writers aren’t. But strangely, stories that last through the ages and traverse cultures tend to exhibit certain forms. There are structural aspects that recur throughout storytelling. One of the strongest and yet least obviously visible aspect of story structure is symmetry. Stories have a tendency to symmetry. This implies that stories have a pivotal midpoint. One can see this in stories from Shakespeare’s Hamlet to James Cameron’s Titanic. Hamlet gains certainty that his uncle killed his father in the middle of the story, and overcomes his hesitation to act. The Titanic hits the iceberg in the middle of the story. If a story is divisible into two halves, you might think it should have two acts. Or maybe four. The reason why narratives are not thought of this way is that the midpoint sits (in a three act story) in the centre of the second act, and while it changes the drive of the plot, the purpose or function of this section of the story remains – the audience accompanies the characters as they deal with problems set up in act 1, face obstacles, and move towards a final goal. When people talk of “rising” and “falling action” in stories, they are usually referring to symmetry. Finally, the idea of symmetry can be seen in the “well-roundedness” of stories. If a problem is set up in act 1 and resolved in act 3, then that means there is a scene near the beginning of the story that conveys to the audience what the problem is, and a scene near the end of the story that gets across whether or how the problem has been dealt with. Indeed, you can to an extent match up scenes (or better plot events) in the second half with plot events in the first half. Every scene in the first half finds its equivalent in the second half. Formally speaking, the more such matching you can do the better.